Howard "Scrappy" Johnson was born on February 2, 1920, in Knoxville, Tennessee. He enlisted in the Aviation Cadet Program of the U.S. Army Air Forces on August 7, 1942, and was commissioned a 2d Lt and awarded his pilot wings on March 20, 1943. Lt Johnson served as an instructor and gunnery target pilot at Laredo Army Airfield, Texas, for the remainder of World War II. After the war, Capt Johnson left active duty on January 14, 1947, and served in the Air Force Reserve until returning to active duty on August 28, 1947. He deployed to Japan in May 1948, and he deployed to South Korea at the beginning of the Korean War. In Korea, Capt Johnson served as an F-51 Mustang pilot from July 1950 to June 1951, where he flew 87 combat missions. He served at Goose Bay Air Base, Labrador, Canada, from August 1952 to August 1953, and he served as an F-94 Starfire pilot with the 84th Fighter-Interceptor Squadron at Hamilton AFB, California, from March 1954 to February 1955. During this time he became the first person to fly over the top of the world in a jet fighter when he piloted an F-94B over the Arctic Circle. Maj Johnson next served as an F-89 Scorpion, F-86 Sabre, and F-104 Starfighter pilot with the 83rd Fighter-Interceptor Squadron at Hamilton AFB from February 1955 to June 1958. During this time he set a new world altitude record of 91,249 feet in an F-104A on May 7, 1958, for which he was presented with the Robert J. Collier Trophy for aeronautical achievement by Vice President Richard Nixon. He served with Headquarters Air Defense Command at Ent AFB, Colorado, from June 1958 to June 1960, and then served as a Senior Tactical Advisor with the Military Assistant and Advisory Group in West Germany from June 1960 to June 1963. His next assignment was as an F-104 pilot and Operations Officer for the 476th Tactical Fighter Squadron at George AFB, California, from June 1963 to November 1964, followed by service as Commander of the 436th Tactical Fighter Squadron at George AFB. Col Johnson served as Assistant Deputy Commander for Operations, and then Deputy Commander for Operations of the 479th Tactical Fighter Wing at George AFB, and then as Deputy Chief, TAC Branch, with the Director of Inspection, 1002nd Inspector General Group at Norton AFB, California. He then deployed to Southeast Asia, where he served as an F-105 Thunderchief pilot and Director of Operations for the 388th Tactical Fighter Wing at Korat Royal Thai AFB, Thailand, from September 1966 to August 1967. During this time he flew 117 combat missions over North Vietnam and Laos. Col Johnson served as Deputy Commander for Operations of the 507th Fighter Wing at Kincheloe AFB, Michigan, from October 1967 to September 1968, followed by service as Deputy Commander of Operations and Training for the 4780th Air Defense Wing, and as Commander of Detachment 1, Air Defense Weapons Center, at Perrin AFB, Texas, from September 1968 until his retirement from the Air Force on October 1, 1972. While serving in Thailand, Colonel Johnson helped found the Red River Valley Fighter Pilots Association and served as the organization's first President in 1967. He was inducted into the Kentucky Aviation Hall of Fame in 2002, and he was also inducted into the Florida Aviation Hall of Fame. Major Howard C. Johnson distinguished himself by extraordinary achievement while participating in aerial flight on 7 May 1958 at Palmdale, California. 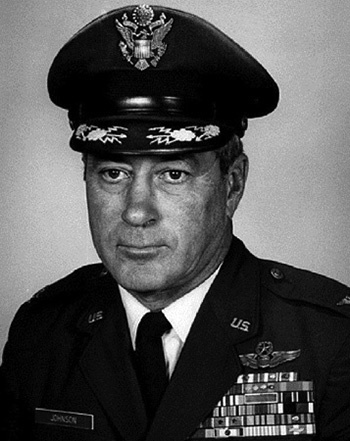 Major Johnson, representing the Air Defense Command in Operation "Sky-High", flew an F-104A Starfighter to an altitude record of 91,249 feet, subjecting himself to unknown hazards. This record exceeded all previous official records by more than 10,000 feet. Through superlative flying skill, Major Johnson achieved this extreme altitude in a "zoom" maneuver, displaying outstanding ability in precision flying that enabled him to fly a perfect maximum performance mission profile. His performance, another milestone in aviation history, reflects great credit upon himself and the United States Air Force.